**StartLogic Express Plan does not support WordPress. The data reported and opinions expressed in this review are based on our purchase of the Pro Plan. No matter the level of expertise, StartLogic has a hosting plan designed to fit almost any webmaster’s skill set. Newbies, intermediates, and tech-savvy professionals can all find a plan to meet their web hosting needs. As StartLogic‘s cheapest hosting plan — Express — does not support WordPress, we purchased and tested the fully-featured Pro plan. It scored top marks for disk space, bandwidth, uptime, support, and BBB rating. We did however, encounter a few usability issues that detracted from our overall satisfaction and tempered our enthusiasm for the firm. On balance, StartLogic Web Hosting has earned the NCM Online designation of RECOMMENDED WITH RESERVATIONS. One of the myriad of web hosting companies (HostGator, FatCow, iPage, IPOWER, et al) now held by the Endurance International Group, StartLogic offers three moderately-priced shared web hosting plans — Express, Pro, and Supercharge. Designed for first-time webmasters and HTML-challenged small business owners, the Express plan includes the easy-to-use Site Expresso Builder. This tool will allow you to build a complete web site without having to know anything about web development or coding. It includes mobile-responsive design templates, a library of licensed Getty Images®, and an auto content creator. The Express plan also includes 5GB of disk space, 100GB of monthly bandwidth, 5 e-mail accounts, unlimited forwarding e-mails, unlimited autoresponders, spam filtering, webmail access, and the vDeck 3.0 control panel. It also includes 1 MySQL database, accommodates sites of up to 6 pages, and does not support WordPress. The Express plan provides four billing options: monthly, 1-year, 2-year, and 3-year. Renewal rates are $7.49 per month for the monthly plan, $7.49 per month for the 12-month plan, $6.49 per month for the 24-month plan, and $5.49 per month for the 36-month plan. StartLogic vDeck 4 Control Panel. Click to enlarge. Designed for bloggers and small business owners with limited to intermediate webmaster skills, the Pro plan includes a choice of website building tools — Site Expresso Builder, or the popular Weebly Drag and Drop Builder, as well access to 1.3 million licensed Getty Images. The Pro plan provides a number of unlimited features including disk space, bandwidth, domains hosted, e-mail accounts, forwarding e-mails, and autoresponders. Plan highlights include the vDeck 4 control panel (screenshot right), the MOJO Marketplace applications installer (screenshot below right), and access to more than 50 popular scripts. Available content management systems include WordPress, Joomla, b2evolution, Drupal, Concrete5, PHP-Nuke, and others. Shopping cart choices include PrestaShop, OpenCart, OSCommerce, Zen Cart, AgoraCart, and others. Forum software includes MyBB, phpBB, SMF, and others. Photo galleries include Piwigo, Coppermine, Zenphoto, Gallery, and 4images. Other popular scripts include LimeSurvey, Lazarus, Dada Mail, Mantis, Pligg, Piwik, osTicket, X7Chat, PmWiki, and many more. The Pro plan supports up to 10 MySQL databases, secure server https protocol, and password-protected directories. Additional features include a backup manager, web statistics, custom error pages, .htaccess editor, as well as access and error logs. The Pro plan provides four billing options: monthly, 1-year, 2-year, and 3-year. Renewal rates are $10.99 per month for the monthly plan, $10.99 per month for the 12-month plan, $9.99 per month for the 24-month plan, and $8.99 per month for the 36-month plan. The StartLogic MOJO Marketplace Applications Installer. Click to enlarge. Designed for advanced webmasters and e-commerce enabled, small- to medium-sized business websites with high traffic, the Supercharge plan includes all of the Pro plan’s features while adding: unlimited MySQL databases, site backup and restore, SiteLock acceleration and firewall, and e-commerce tools. The Supercharge plan provides four billing options: monthly, 1-year, 2-year, and 3-year. Renewal rates are $14.49 per month for the monthly plan, $14.49 per month for the 12-month plan, $13.49 per month for the 24-month plan, and $12.49 per month for the 36-month plan. While it is normally our practice to purchase a host’s cheapest available shared plan for purposes of testing and reviewing, our one stipulation is that the plan support WordPress. As the StartLogic Express plan does not support WordPress we purchased the Pro plan. StartLogic utilizes a simple, two-step checkout process. In Step 1 a domain name to be used with the account is entered. You are also provided with the option to purchase a new domain (free of charge for the first year). In the interest of transparency, we would have preferred that the shopping cart pricing had been marked with asterisks an a link to the renewal rates provided at the bottom of the page. Another part of the checkout process we take issue with is the fact that two “Website Essentials” options are automatically added to the shopping cart. “Advanced Site Protection and Performance Accelerator” and “automated daily backup” were checked off by default and added to the billing total. We unchecked both and completed the checkout process. NCM Online has and will continue to point out any less-than-transparent business practices employed by the web hosting companies we review. Further, we have and will continue to deduct from the ease-of-use and satisfaction ratings of any host that utilizes such practices. StartLogic’s ratings have been adjusted accordingly. Approximately two minutes after submitting our order, the “StartLogic Order Confirmation” e-mail arrived in our inbox. Unfortunately, it did not include the information required to set up our test site quickly — nameservers, FTP login, control panel login, and e-mail settings. It did include a link to create a password for the account and a link to the control panel. After creating our password we were able to access the vDeck 4 control panel (screenshot above right). From there we were able to access the nameserver and FTP login information required to set up our test site. StartLogic Web Hosting 10-day Uptime Test Results Chart. Click to enlarge. Generally, we found our StartLogic Pro hosting account to be easy to use. While we prefer the cPanel control panel, vDeck is equally capable of performing all required webmaster functions quickly and easily. The Pro plan utilizes the MOJO Marketplace installer for WordPress and other application installations (screenshot above right). We find MOJO Marketplace to be a bit on the slow side, and are not particularly fond of the advertising displayed during the application installation process. Given a choice, we prefer the Softaculous applications installer, but MOJO is equally capable and easy to use. StartLogic Web Hosting 10-day Speed Test Results Chart. Click to enlarge. 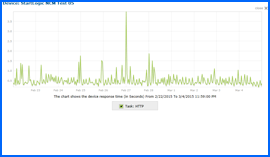 Page-load speed and uptime testing for our simple 1-page test site began on 2/22/15 and concluded on 3/4/15. We are pleased to report that StartLogic achieved a 100% reliability rating throughout the 10-day testing period — which included 1044 separate server reliability checks (see Uptime Test Results Chart above right). Page-load speed proved to be better than average. StartLogic averaged 1.4466 seconds to load our test page from 13 worldwide locations over the course of 10 days and 1030 separate tests (see Speed Test Results Chart above right). 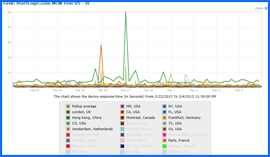 U.S. page-load speed proved to be equally good. StartLogic averaged 1.0578 seconds to load our test page from 7 U.S. locations over the course of 10 days and 555 separate tests. 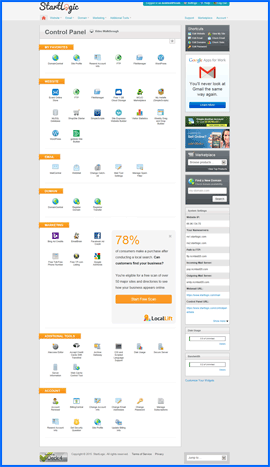 We found StartLogic to be better than your average shared web host. However, the cost of the Pro plan combined with a somewhat-less-than-consumer-friendly checkout process prevent our unqualified endorsement at this time. StartLogic has earned 4 stars and is recommended with reservations. Cheap website hosting company price comparisons based on 1-year term list price before coupon/promo codes or limited time/introductory offer discounts. These are the renewal rates for the second year of hosting. To ensure that you receive the most affordable StartLogic Web Hosting pricing possible, please visit our Web Hosting Coupon Codes page for current discounts and special offers before making any purchases. StartLogic had its beginnings in the home of a couple of youthful entrepreneurs who had the desire to assist small businesses in getting their websites online. Since then, the firm has grown rapidly and now serves more than 50,000 clients. It provides support through its top-notch staff gathered from all over the world. StartLogic’s personnel team is full of tech experts, brilliant engineers, straightforward leaders and matchless support agents, who are at their best when they pool their individual talents. The company runs a world-class platform that utilizes servers of the most powerful type found in the industry. The firm is proud of its humble origins and background, but is even more proud of its achievements. StartLogic offers webhosting that includes unlimited disk space and bandwidth, unlimited email accounts, a free domain name and an SSL certificate. To assist in website building StartLogic offers a free point and click website builder, FTP for quick and easy uploads and a free script library. StartLogic sites are FrontPage and Dreamweaver-compatible and come with free installation of E-commerce tools to set up an online store. The company offers 24/7 support to its customers and includes customer feedback tools with its subscriptions. StartLogic maintains two centers for data in the Boston, MA area. The combined centers comprise over 2400 square feet, have thousands of servers with numerous Petabytes of storage. The centers have 24 hour security and run on both A/C and D/C N+1 power. The company’s robust, secure network infrastructure utilizes a pooled server environment, so that the first available server in the network can access website files when a customer request is received. This setup results in fewer service interruptions and quicker site loading times than those afforded by hosting companies with traditional infrastructures. The front-end network’s redundant routers use BGP (Border Gateway Protocol) to provide worldwide connections through multiple providers. Site data is analyzed by load balancers before being managed through high-quality data servers that are split into various application pools including incoming mail, Web, FTP, etc. This type of infrastructure permits StartLogic to tailor each server to fit the function it performs. This results in greater density per machine, which in turn provides quicker and more dependable services. StartLogic’s storage is network-attached so that any machine can access a customer’s database. Each machine is matched with an identical one so that the second can take easily respond if the primary one fails. In addition, data from the units is backed-up on another set of storage units that have a mirror copy of the data in case of disk failure in the primary units. StartLogic has partnered with some of the preeminent firms in the industry. The company is strengthened by its partnerships with firms that build powerful websites and those that provide superior security tools. Together they are able to provide customers enhanced service offerings. In 2011, Google selected StartLogic to partner with them in a program for small businesses called Get Your Business Online. This program not only provides the services and tools needed to build websites that attract visitors, but also gives the participants the education and know-how it takes to expand and succeed. This video tutorial will show you exactly how to install WordPress on your StartLogic shared hosting account using the vDeck 4 control panel and the MOJO Marketplace applications installer.